Privateer Press releases four new factions in a stand-alone core set for its ever-growing deck-building game. I will preface this review by stating that I will not be talking very much about the mechanics of the game. If you are completely new to High Command, and you would like to know more about how it plays, I strongly suggest checking out either our initial review of the High Command: Warmachine core set or watching Privateer Press’s most-excellent tutorial video below. When the initial core sets for High Command: Warmachine and Hordes launched late last year, there were some pretty strong, and arguably well-justified, concerns about the balance of the game. These worries were centered around strategies using Khador or Circle Orboros to simply purchase one’s way to victory instead of actively engaging in fighting for control of locations. Not only was this strategy decidedly not fun to play against, it was brutally effective such that they won an inordinate number of games in addition to marginalizing many of the other factions completely. While these concerns would be addressed and ultimately corrected over time via the release of five expansions for each of the original core sets, it still left a bad taste in many a player’s mouth. 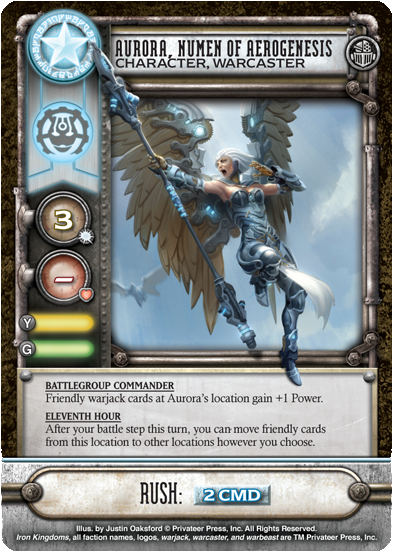 Despite eventually transforming into a much more fun, interactive, and fairly balanced game with an actively developing metagame and supporting community, many players have been apprehensive to give High Command another look after they had a less-than-stellar experience with the core set, which can be a really difficult hurdle to traverse when attempting to grow a game. I bring all of this up, because the Faith and Fortune core set is a case study in a gaming company learning from past mistakes and correcting them. In addition to this, I feel that they took a lot of what was actually really good about the original core sets and greatly improved on them as well. Jumping right into the game itself, Faith and Fortune introduces four new factions to the game: The Retribution of Scyrah, the Convergence of Cyriss, the Highborn Covenant, and the Four Star Syndicate. Courtesy of Privateer Press Digital. Used with Permission. In High Command, the Retribution utilizes mechanics that allow them to properly tailor their hand through ubiquitous draw/discard effects. In general, Retribution resource values tend to be quite high, but their rush margins are often quite punishing. There are some decidedly unique and interesting cards to play with, particularly the Soulless Expendables who are 1 CMD to purchase and 8 to rush, have 4/4 for stats, and go straight to Occupying Forces when destroyed. Retribution tends to favor cards with generally higher costs, making the faction generally feel like it is made up of consummate, elite soldiers. The Convergence plays as a synergy-heavy faction with strong resource values throughout, save for a few outliers. 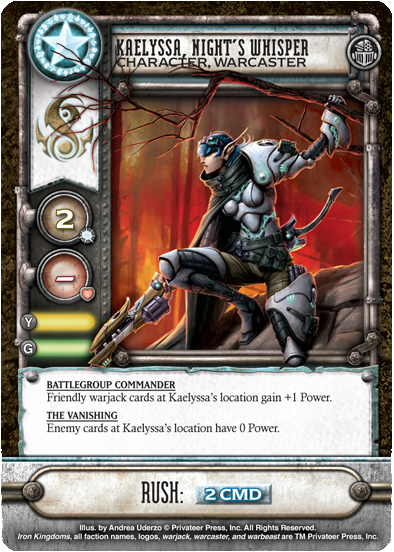 While Victory Point-scoring cards are generally lighter in Faith and Fortune than in previous core sets, the Convergence seems to have a higher volume of such cards than other factions, but not nearly in such a manner as was originally abused by Khador or Circle Orboros at their launch. In general, Convergence rush margins tend to be fairly palatable save for some of those heavy infantry cards like Perforators or Reciprocators with their aggressive purchase costs but prohibitive rush costs. Cards like the Corallary or the upcoming Transverse Enumerator Core will, however, be quite helpful in making even the most expensive to-rush cards a strong possibility. Convergence’s strengths typically rely on their abilities and the stacking thereof, like deploying Perforators and a Cipher to a single location so that their Armor Piercing and Flare abilities reduce a card’s health by 3, effectively making the pair Power 7 against a single hard target. The Highborn Covenant tends to be on the pricey side for rush costs but is flush in resources with every single purchasable card worth at least 2 CMD or WAR. Their rush margins are greatly varied throughout the faction, so there is not a clear theme revealed in that respect. While not as synergy-heavy as Convergence, the Highborn Covenant does have several cards with abilities that play off each other, like having a variety of warjacks with the Powerful Attack rule in addition to cards with Warjack Marshal. Cards like the ‘Jack Hunter Company and Amethyst Rose Gun Mages additionally have abilities that reduce the power of specific enemy card types to 0 for a turn, presenting some strong capture denial mechanics. There seems to be two mechanics common in the Four Star Syndicate: Thralls Runes and chance abilities. Thrall Runes is an ability found on undead cards, specfically the Risen Thrall Mob and upcoming Warrior Thrall Mob cards. This ability allows said cards to be deployed from their discard pile. While they typically have rather low resource values, purchase costs are also quite low, allowing them to be effectively rushed for fairly cheap, particularly if there is a Wandering Necromancer card at their location to further reduce the cost of deployment. This ability can be especially powerful for situations where rushing is denied, since purchasing a card and then deploying from discard circumvents that restriction. The gambling mechanics in Four Star typically require you to flip over the top card of your army deck to check for card type. If a certain card type is revealed, an effect is triggered. 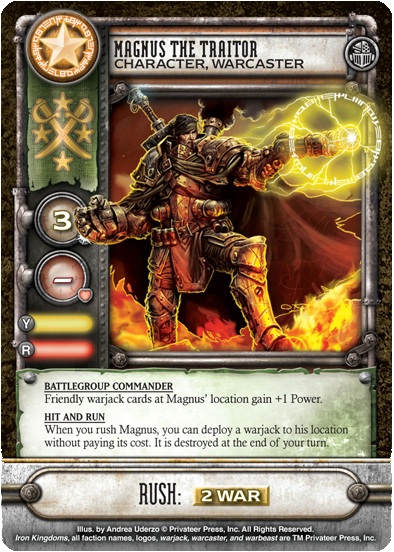 For example, the Loader ability on the Mariner warjack grants a +2 Power bonus if the card revealed is a warrior. Trollkin Sellswords have the Defiance ability, which makes them effectively invincible if the revealed card is a warrior. Some of these effects can also be negative, as with the Toro’s Jury-Rigged ability, which can send it back to your hand if the revealed card is a resource. Overall, Four Star has an interesting mix of cards to work with. Cutthroats and Highwaymen are especially strong with their single VP, fantastic rush margin, and Ambush ability, which automatically destroys a warrior card of choice when they are deployed or rushed. 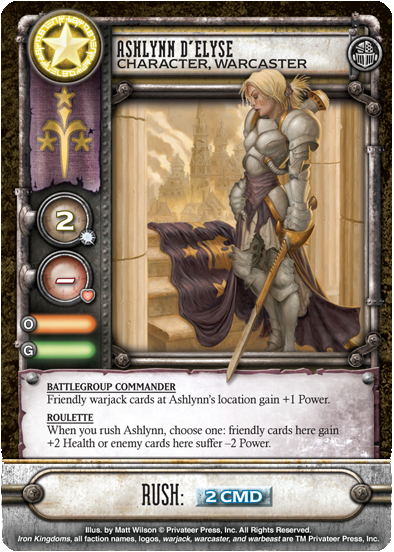 Compared to the original core sets, the location deck in Faith and Fortune is bereft of locations that give benefits to specific factions when captured, which is a good thing for several reasons. First is that it seemed to benefit certain factions (albeit in a very small manner) at the expense of others. If you were playing Trollbloods with the Warmachine core location deck, that type of card was never going to come up in your favor. The second reason why this is a good thing is because those types of cards were not very interactive at all. 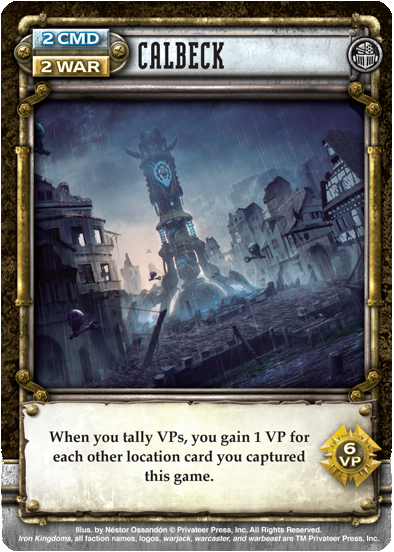 In their place, we receive much more interesting locations like Laedry, which allows the player spending it as a resource to discard one card to refresh his entire reserves, or Calbeck, which will favor aggressive decks that are always looking for captures as opposed to simply favoring one faction of eight. Berck, which grants extra VPs for having warjacks in your reserves, forces the player to actively consider what they will want to purchase or rush as the game moves into the later phases. The Winds of War deck is generally pretty simple in application, but has two cards that are particularly interesting, specifically Desperate Measures and Final Reckoning. Desperate Measures allows a player to bank any number of cards at turn’s end with one copy in the Mid and Late phases. This can potentially allow players to have hugely aggressive turns, albeit with a certain amount of associated risk. First, if Desperate Measures is flipped on the tenth game turn at the end of the Mid phase or at any point during the Late phase, there is a significant risk of drawing Final Reckoning and ending the game on the following turn, thus making any banked cards of zero value since you will not have a turn to use them. The other problem is with Redirection, another Mid-phase card that denies players from rushing warjacks, warbeasts, or warrior cards, forcing players to spend all those saved resources on purchasing or deploying cards instead. 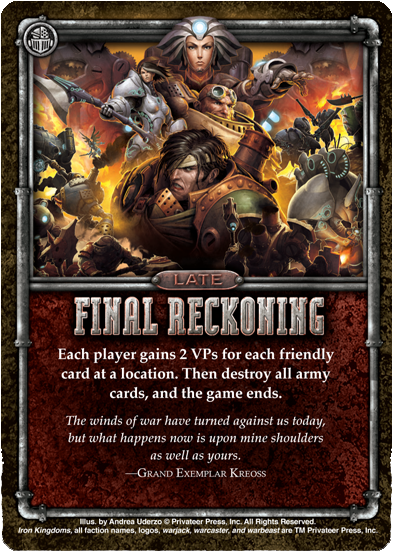 Final Reckoning is the new end game card in Faith and Fortune, a departure from the ubiquitous Day of Reckoning from previous expansions. I feel that Final Reckoning is really what Day of Reckoning should have been to begin with, as it does not grant a massive amount of favor to risk-taking players who go get to go last, potentially netting them huge Victory Point swings via end-game captures. While Final Reckoning still arguably favors the player going second, the advantage is not nearly as strong as it was with the original Day of Reckoning card. I have already touched a bit on how Faith and Fortune has improved by noting specific differences with the Winds of War and Location decks, but it goes beyond these changes. Based on the dozen-or-so games played, the four factions feel pretty well balanced against each other out of the box. Not once did I feel like one faction had a noticeable advantage over another. They all seem to have strengths, weaknesses, and unique play styles without upsetting overall game balance. The other thing of note is that cards with niche abilities and stronger mechanical themes tend to be present in greater volume in Faith and Fortune, particularly with cards like the Soulless Expendables with their crushing stats at 1 CMD to purchase in return for an awful rush cost and zero resource value. Cards like the Expendables, Amethyst Rose Gun Mages, Wandering Necromancers, and Corollary, are all really heavy on theme and ability. This grants Faith and Fortune stronger flavor as a base game as well. There seems to be a decided reduction in game design with Faith and Fortune in regards to cards that have VP values, specifically where the 1 CMD/3 WAR and 3 WAR/1 CMD cards are concerned. Where in the original core sets these cards all scored a single Victory Point, in Faith and Fortune they do not, albeit with the benefit of costing one less resource to purchase. Additionally, the relocation abilities on these card can be processed regardless of which resource you use the card for, making its application much more likely. This is a great decision on multiple levels. First, I feel that this change creates less of a downside in deciding to take the 2 CMD/2 WAR resource cards, which lacked VP values in the original core sets as well. Where before running those 2 CMD/2 WAR resource cards effectively felt like I was losing potential Victory Points from my deck over running the 1 CMD/3 WAR or 3 CMD/1 WAR cards, this is no longer a problem since none of these cards innately score. The second positive change here is that this further encourages aggressive play since it reduces the consistency of the passive purchasing of resources as a path to victory, which was a large problem with the original core sets. My only concern about this change is that the reduction in potential Victory Point totals in the new factions’ reinforcement decks will make it more difficult for them to compete against the original eight factions. Granted, this was to be expected from a freshly-launched core set when comparing its contents to other sets that have five expansions to round them out, I am worried what things will look like in the long term once Faith and Fortune has “caught up” to the existing Warmachine and Hordes factions. How Will Schick and David “DC” Carl will manage this disparity over time will be very interesting to watch. While a minor thing, I do feel the need to point out that the box art is improved this go around with Privateer Press eschewing the unique, but generally disliked art from the original core sets and replacing it with the always-excellent artistry of Andrea Uderzo, whose work can be found everywhere from Warmachine to Dark Heresy to Hearthstone. 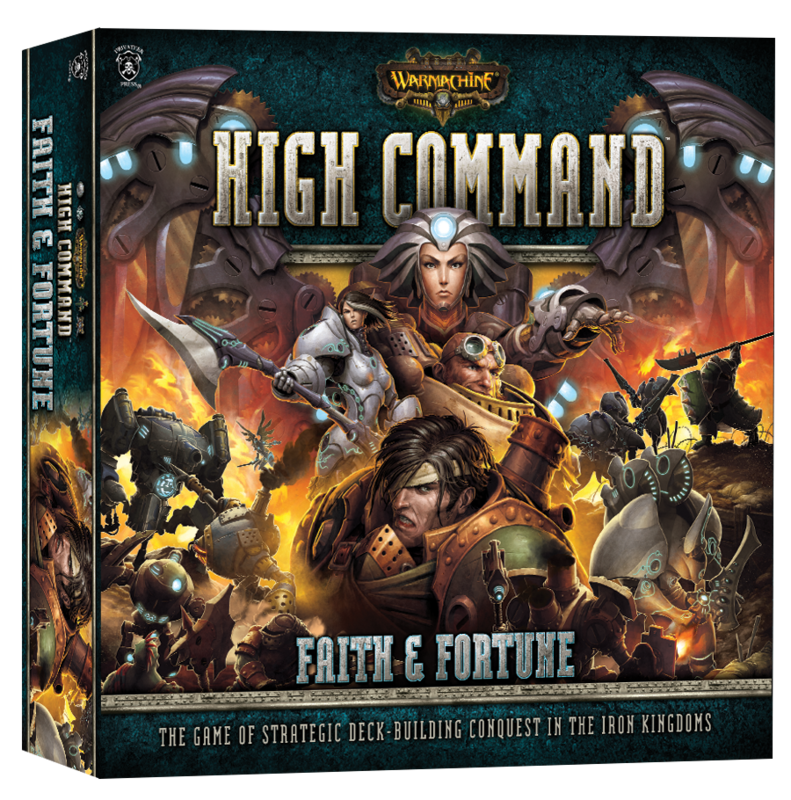 Faith and Fortune is a fantastic addition to the High Command line of products, and is going to be my go-to recommendation for players looking to get into the game. It manages to both correct past mistakes while also improving on nearly every part of the game as well, including with balance, mechanics, flavor, and even the art. If you have been considering getting into High Command, with Faith and Fortune available, now is the time.